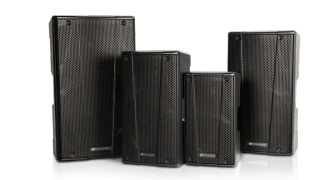 The What: The B·H Series of powered loudspeakers includes four two-way cabinets, all of which have been equipped with 1² compression drivers and 8², 10², 12², and 15² woofers. The What Else: The design features an asymmetrical horn for a wide and uniform throw pattern. The dB Technologies team has crafted accurate digital sound processing, allowing users to choose between two EQ presets: flat or boost. The lightweight cabinets (from 14 to 38 pounds) are outfitted with a contemporary full grille design, enhancing portability with three handles (one per side and one on top) and multi-functionality. Each cabinet can be used horizontally as a stage monitor (with two angles) and features a pole mount cup for a tripod stand or stacked on dB Technologies subwoofers. The Bottom Line: B·H Series aims to provide a professional yet efficient sonic performance to every user, combining an efficient Class D amplifier with aggressive sound pressure levels (up to 126.5dB for the 15² cabinet), with accurate reproduction.